Should Your Software Or Hardware Firm Go International? You are here: Home / Business Development / How Soon Should Your Software or Hardware Company Go International? This is a question that frankly doesn’t come up often enough at early stage tech companies. There is usually an assumption that you first conquer your home market and then sometime WAY down the road when you are already flush and successful, it will be time to expand internationally. US-based tech companies are most guilty of this often questionable thinking. How Soon To Go International? What’s wrong with this approach, especially for US-based companies? After all, the US is the largest market in the world and it’s far easier to sell to customers close by then it is halfway around the world. With this the case, why should you use your scarce early-stage capital in a risky international expansion? This is how the thinking goes. As an early stage software or hardware company, you need to find early adopters of your product. These folks fit a certain psycho-graphic profile and they are much rarer than the average customer. In some markets you may need to cover the earth to find them. Limiting your geographic scope unnecessarily only makes the job harder. Also, remember the world is a much smaller place commercially than it was even a decade ago; especially with the mainstreaming of the Internet. It’s not nearly as hard to find these important early customers tucked in far away places than it was in even the very recent past. This is one of the bigger reasons to go international that newbies don’t understand. They think that with all the money they are spending to penetrate the home market, selling internationally will be that much more expensive yet. But it doesn’t have to be. In many markets, you can find distributors who will take on much or most of the marketing and sales load, reducing your investment tremendously and allowing you to leverage their existing relationships and brand names–rather than “starting from scratch” on your own. Unless your home market is a tiny and particularly un-competitive one, there are most likely many other more under-served markets available to you that have a lot of low hanging fruit. Why? Nearly every startup software or tech company thinks the same way and focuses initially on their home market. Since the bulk of the tech business is located in the US, it’s by far the most brutally competitive market of all. Getting to a new market early can often mean the difference between success and failure. If you’re the first one in a country or region, the early adopters and other low-hanging fruit are there for you alone. You will get your pick of the best distribution partners and your product category will be “fresh” news for the media. Once you are established it will be harder for later arriving competitors to push you down the market share ladder, even if they are larger than you overall. So when should a company go International? The short answer is as soon as you can possibly do it. But what’s most important is to fully evaluate when “as soon as you can” actually is. This should go without saying, but the only thing that causes a greater catastrophe than an unstable product is an unstable product distributed worldwide! Don’t do this–make sure things are solid before venturing away from where it’s easiest to “babysit” early problems. While I’m a proponent of aggressive international business development at an early stage, there is such a thing as “too early”. 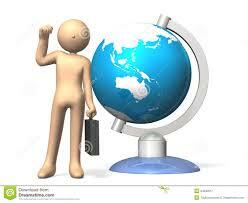 Make sure that you know your product has some kind of a market before going far away from home. It’s a pointless exercise to be recruiting distributors and customers in foreign markets with a product that doesn’t really hit the mark with anyone, and one which doesn’t even had a reference customer list. If you can’t gain 10 or 20 or 30 customers close to home, heading far away likely won’t help. Businesses that require the stockpiling of large amounts of inventory are one of my exceptions to aggressive early international development. That means hardware companies generally need to be more careful that software companies. Companies that distribute through retail channels need more inventory than those who sell via VARs or direct, so they also need to be even more cautious. The issues that come with inventory, such as repairs and returns, are exacerbated by borders and distance. So if you’re company is inventory intensive, maybe start with one smaller market rather than a large regional roll-out, to test that everything goes smoothly before placing a big bet. If you have to establish your own local foreign operation, hire a bunch of people, rent office space, etc–you generally need to wait. Most startups can’t afford this type of risk and investment. However, although some feel this route is their preference due to control, it’s generally not mine. It’s quite risky and slows your international progress rate down significantly. Most companies can start out by using partners and often this is a good long run strategy as well. If you’re wildly successful and really feel the need for total control, you can always buy out distributors later on. English is the universal language of technology. In some vertical markets (such as Enterprise IT software) English language-only products are often fine. These are markets where you can make the fastest internatonal penetration after proving your product in your home market. If you do need local translations, they really aren’t that expensive in most cases and can be done quickly; distribution partners can often help. But make sure that you don’t skimp on a good translation; nothing will hurt your local credibility more than language that isn’t proper, or at worst, makes no sense. This is also an area that can slow down the potential for fast international market development. Many countries or regions have safety or electrical standards that will require product modification or testing (and thereby investment). There are also legal aspects that need to be considered (European privacy laws when selling security or marketing software, as an example.) Don’t let these stop you from doing an evaluation of your international prospects, but these factors can change the calculus of your decision-making on how soon to take the international plunge. If you’re a software company using the SaaS model there may be very little downside to early international business development. If latency isn’t an issue for your product, you may need no international investment at all. Or maybe you need your servers hosted in other parts of the world to reduce latency issues, but this shouldn’t be a huge investment and can be accomplished sometimes as simply as using a CDN. You still need marketing in the local markets, either by your own direct (albeit remote) methods or through partners. But given the potential rewards these investments should be a small price to pay. When you first go into a foreign market, it’s important to understand that you can’t fully comprehend the local culture, as well as how commerce functions there. Know what you don’t know. Listen more than you talk at first. Hire an international business consultant if you can afford to. Partners can also help greatly here. But if you are a savvy, experienced international business person it certainly raises your odds when attacking foreign markets early on. Are there customers “champing at the bit” for the benefits your product offers? Or will there be a bit of an education process and a long sales cycle? Obvious existing demand is a key bullish indicator for aggressive international business development. The bottom line is that going international quickly can be a big boost to early growth for a software or hardware tech company. Be careful, but not overly cautious. Evaluate your specific situation and take the plunge if the odds are with you. What’s your take on the proper pace for international business development? Post a comment or send us your story via on of the options below. I read your article with great interest having spent several years doing much of what you suggest and agree with much of what you propose. I think there is somtimes a danger that your international expansion is driven by specific opportunities eg an International client and/or Business Partner that has requirements beyond your home or prefered focus markets/geos. I think the product or solution set that your taking to market is key and requirements to deliver effective representation in each market you choose to go after needs to be thoroughly planned for even if you have a very willing business partner. Solutions that have a significant delivery capability requirment including localisation (not just translation) can be very demanding on resources and support to get your partners operating independently in their regions. I guess my point here is the need to evaluate each of the international markets that you could potentially go after and make some tough choices about which ones you will go after and which ones you wont be able to effectively support short term.